Storage: Keep in a cool and dry place. After opening: Consume as soon as possible. Ingredients: Noodles: Wheat Flour, Palm Oil, Modified Starch (E1420), Potato Starch, Wheat Gluten, Salt, Yeast Extract, Emulsified Oil (Soybean Oil, D-Sorbitol, Soybean Lecithin, Glycerin Esters Of Fatty Acids), Alkaline Agent (Potassium Carbonate, Sodium Polyphosphate), Guar Gum, Onion Extract, Calcium (Egg Shell), Riboflavin. Liquid Soup: Jjajang Seasoning Sauce (Black Bean Paste, Caramel, Salt), Glucosaccharide, Water, Jjajang Seasoning Powder (Black Bean Paste, Caramel, Salt), Sugar, Corn Oil, Yeast Extract Powder, Onion Oil, Onion Powder, DL-Alanine, Glycine, Disodium 5-Inosinate, Disodium 5-Guanylate, Palm Oil Powder, Caramel Powder, Sesame Oil, Salt, Ginger Powder. Vegetable Mix: Textured Vegetable Protein (Soy Wheat), Cabbage, Onion, Fried Potato. 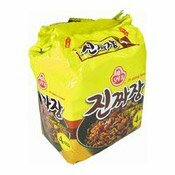 Simply enter your details below and we will send you an e-mail when “Instant Noodles Multipack Jin Jjajang Ramen (韓國炸醬麵)” is back in stock!